Last Updated: March 10, 2016 | Subscribe to our weekly newsletter! There is nothing quite as distasteful as stepping into a hot tub and then noticing there is a rather disgusting looking ring around the water’s edge. Trust me, I know from experience. Battling a scum ring around a hot tub is a common problem for many hot tub owners out there. However, it isn’t necessarily a problem that you simply have to live with. In fact, there are many things you can do to clean and prevent the scum ring around a hot tub. As you can see, these are all very common on all of our skin. When we take a dip in a hot tub, these chemicals wash off our bodies and into the water. Over time, they build up in the hot tub causing the ring to form around the tub. Of course, it isn’t always our fault. Sometimes it is the water. If our water has an excess of calcium in it, scaling can occur. When this happens, you will begin to notice a scummy coating around the sides and even the fixtures of your hot tub. So, how exactly do you get rid of it once and for all? First, you need to identify the type of scum that you are dealing with in order to properly treat the problem. First, test your water to see if you have a buildup of excess calcium. If you do, you know that the scum ring is most likely a calcium buildup. Treat your water to reduce the amount of calcium in your spa and then clean the ring with your cleaner and a soft cloth. If your water is fine, then it is most likely a buildup of makeup, lotions and other body oils. In order to remove it, take a soft cloth and add a little of your cleaner to it and gently rub the line until it is gone. Make sure you keep the cloth out of the water, as the cleaner can contaminate the water and even lead to a foamy buildup. If you are getting tired of cleaning those scum rings day in and day out, perhaps it’s time to try and stop them before they ever have a chance of forming around your spa. How do you do that? First, I’m going to be honest with you. Sometimes, you may get the ring no matter how much effort you put into preventing it. However, there are several things you can do to stop it from forming. At the very least you won’t have to clean off a ring quite as often. Most rings around a hot tub are formed from various oils, makeup, detergents, and antiperspirants found on the body. While you and your friends or family are soaking in the hot tub, the warm, bubbling water slowly washes off some of these chemicals on your body. Over time, these chemicals build up in the hot tub causing that ugly ring to form around the side. In order to put a stop to the ring, institute a shower first rule before getting into the hot tub. Remove any makeup, lotions, etc. with a quick shower before you go for a soak. While this won’t eliminate every bit of oil and other contaminants found on the human body, it will go a long way toward limiting how much of them can enter your hot tub. Balanced water is happy water, and water that is very clean. You should test your water at least once a week and add the proper chemicals to the water to make sure its pH and total alkalinity levels always remain balanced. If you are battling scum or foam problems, try increasing how often you test and balance your water to see if that helps. You should be shocking your hot tub once every 1-2 weeks if you are using your hot tub on a regular basis. Shocking your hot tub with both chlorine and non-chlorine based shocks can help break down the organic materials in your hot tub that lead to scum build up. If you are shocking your hot tub every couple of weeks and you still notice scum buildup, try shocking it once a week. This will give your hot tub an added boost that could prevent that ring from showing on the sides of your spa. Dealing with scum rings is just a part of being a hot tub owner. Thankfully, they don’t have to be a difficult problem to solve. Using a good cleaner and a few easy to do prevention methods, you can quickly knock out that scum ring once and for all and keep it from ever showing its ugly head again. You've cleaned it, balanced it, but your hot tub water is green. What is it?! Find out the causes, and learn effective treatment and prevention tactics. Do you have oily scum on hot tub water? If so check out how you can remove it and then prevent that scum from ever returning. 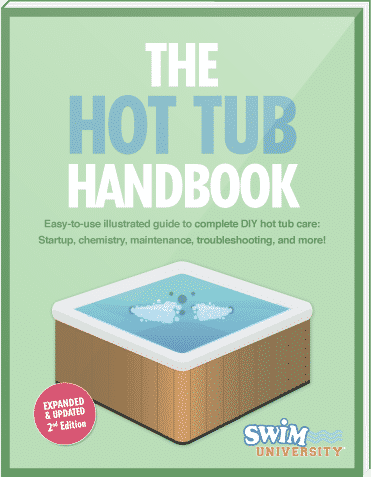 Find out all the steps you need to take to remove and prevent hot tub scaling so you can enjoy your hot tub without that unsightly build up on your hot tub. Let’s examine the most common stains and what you need to do to clean them so you and your guests can enjoy a clean and clear hot tub.